Meanwhile, in a medium saucepan, heat milk to just below boiling (about 180°F), stirring constantly to avoid that gross film that forms on top. Remove from heat and allow to cool slightly to 110°F. In a large bowl or bowl of a stand mixer, mix the scalded milk, sugar and salt until just combined. Add eggs, yeast mixture, vanilla extract, melted butter and flour and stir until just combined. Switch to a dough hook and knead in stand mixer for about 5 minutes, adding 1 tablespoon flour at a time until dough starts to pull away from the sides of the bowl and is smooth and elastic; OR, place dough on a lightly floured countertop and knead by hand for about 10 minutes, adding 1 tablespoon of flour as necessary until dough is slightly sticky and smooth and elastic. Meanwhile, make the filling: Grind the walnuts, sugar and cocoa powder in a food processor until finely ground like coarse sand, and transfer to a medium bowl. In a medium saucepan, bring milk and butter to a boil, then pour the liquid over the nut mixture. Add egg yolk and vanilla and mix thoroughly. Set aside until mixture comes to room temperature. Preheat oven to 350°F. Uncover pan and bake bread for 15 minutes. Decrease oven temperature to 300°F and bake bread for another 30-40 minutes, checking on the loaf after 20 minutes to make sure it’s not too brown (if it is, cover with a dome of aluminum foil to prevent over-browning). Bake until a thermometer inserted in the center of the dough reads 200-210°F. Remove pan from oven and allow bread to cool in pan on a cooling rack for 20-30 minutes, then allow to cool completely outside of pan before slicing and serving. Hi, my name is Stephanie, and I’m a Pinterest addict. It’s true. I’ve found the land of endless DIY hanging plant holders, pictures of puppies holding teddy bears and hairstyles I’ll never achieve thanks to my terrible lack of coordination (all I want is one successful ballerina bun, is that too much to ask?!) and I’m not going back. It’s also where mine eyes first lay upon a picture of Povitica, a Croatian sweet bread that I knew, like love at first sight, had to be in my kitchen. Right. Then. There was no time to waste! I was a girl obsessed! This bread was destined to get in my belly! It was admittedly a low point. And then, I saw the gargantuan list of directions. My heart sank. I was done for. In my post- Pinterest-scrolling stupor, I knew I’d give up as soon as the recipe called for any verb. However, after a few hours of wallowing in my self pity of non-povitica-ness, I decided enough was enough. I would have this bread in my possession, and nothing would stop me – not a long list of ingredients, nor a long list of directions. So I tweaked it a bit, easy-fied it (I make up words, go with it) a little and made it my own. And goodness gracious, I’m glad I did. This sweet bread is, hands down, one of the best I’ve ever baked or tasted. 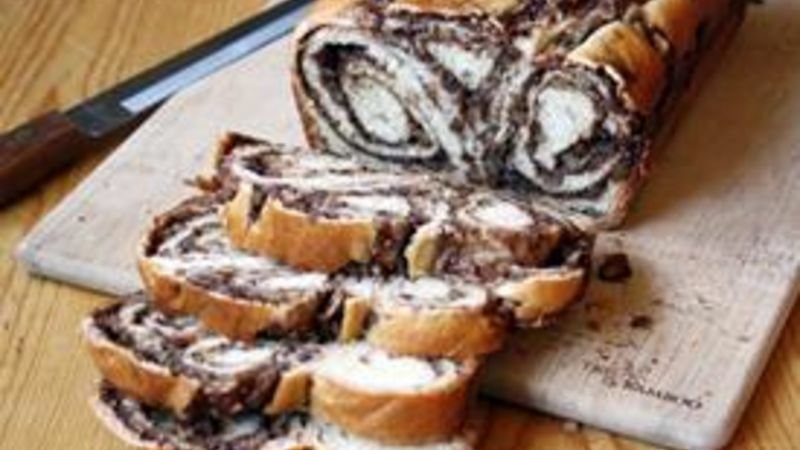 The combination of chocolate and walnuts and butter swirled throughout the loaf is out of this world. Sure, this recipe takes some time and lovin’, but let me tell you, it’s worth every minute and ounce of effort. So pry your eyes off Pinterest, just for a minute, and get down to baking business. You won’t be sorry.